Economists and politicians that become addicted to quantitative easing, often fail to realize when it is no longer working. Touted as a panacea for economies caught in a malaise, it is supposed to deliver new economic growth and stave off the harmful effects of deflation. Based on a theory that if a dose of quantitative easing (QE) is good for a stagnating economy, more of the same should be even better. The best modern example of this in the 21st century, is Japan. The results there should be a cautionary illustration to the policy makers in Europe, the United States and elsewhere. New investment in the domestic economy of Japan continues to remain elusive. 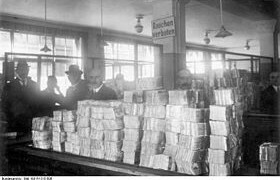 If simply printing money was the answer to the lack of growth in the economy, then Weimar Germany in the early 1920’s, should have been the most prosperous economy in the world. The German government unlike France, decided to fund World War I entirely through borrowing. By the end of the war, the German Mark had gone from 4.2 to 8.91 convertibility to the United States Dollar (USD). By the time of the signing of the Treaty of Versailles officially ending the war in 1919, the Mark had further depreciated to 32 to 1 USD. By 1921 further devaluation had taken place, but the Mark somewhat stabilized at 90 German Marks to 1 USD. As a result that Germany was not invaded during the war, the country emerged with an intact industry with a relatively healthy economy, that seemed poised to become the dominant economy on the continent. However, according to the London Ultimatum beginning in June of 1921, there was a demand that the Germans pay in gold or foreign currency the equivalent of 2 billion Goldmarks plus 26% of the value of Germany’s exports. In November 1921, with the first payment already made, the Mark had dropped to a rate of 330 to 1 USD. That would be 1/3 of a cent. The total reparations that had been originally demanded was 132 billion Goldmarks. This had already been reduced to 50 billion Goldmarks. In order for the Germans to continue to pay the reparations through purchases of foreign currency, a new policy was enacted. It was the mass printing of bank notes. Of course, the more that were created, the more that would soon be needed. 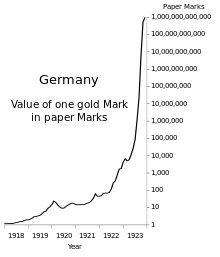 Weimar Republic Hyperinflation From One To One Trillion Paper Marks Per Gold Mark; On A Logarithmic Scale. At the end of 1922, the Mark had fallen to 800 per dollar. The cost of living index had increased 15 times in just 6 months. In order to ensure that payments would be made, French and Belgian troops occupied the Ruhr valley which was the industrial heartland of Germany. This occurred at the beginning of 1923. Reparations were now made with goods, since the Mark could no longer be used to purchase gold or foreign currency on the open market. German industrial workers in the occupied areas, then went on strike in protest to the occupation. The German government decided to continue to pay their wages, even though they were no longer working. That finally totally destroyed the currency. By November of 1923, just 1 American dollar was now worth 4.2 trillion German Marks. 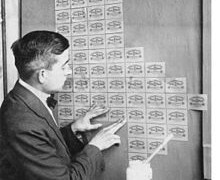 Hyperinflation had arrived with a vengeance and a financial era soon came to a close. A new medium of exchange the Rentenmark, was adopted later the same month. This new money would be backed by real assets, so the old Marks would now be traded for a rate of exchange of 1 trillion to 1, when the new currency (Reichsmark) was adopted in 1924. The German example is where the mindless printing of money can lead, if financial safeguards are not in place. It also indicates the limits to monetary policy. It is important to note that Germany was the leading economy in Europe at the time, as it is today. It is a cautionary tale to those who feel monetary and fiscal policy alone, will be the substitute for economic reforms that bring real growth. 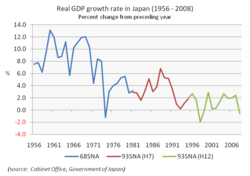 Japan has been stagnating economically since the end 1990. Originally the years 1991 to 2001 were referred to as the Lost Decade, but recently the following decade 2001 to 2010 is often included. It has become the Lost 20 years. Over the period from 1995 to 2007 for example, GDP (Gross Domestic Product) fell from $5.33 trillion USD to $4.36 trillion in nominal terms. In addition, real wages declined by 5% and the country witnessed a moribund price level. The direct cause of the crash after years of strong economic growth, was a speculative asset price bubble on a massive scale. The unique relationship between the Japanese banking system and domestic corporations, made credit entirely too available. It was an excellent example of crony capitalism that helped to lead the Japanese economy to disaster. In response to this dilemma, the government aggressively raised interest rates leading to a collapse in asset prices and the Japanese Stock Market. This forced the government to bail out the banks and other financial institutions with infusions of capital from the central bank. This allowed many of them to continue to operate, even though many of them were now technically insolvent. They became over time what is referred to as zombie banks. Collectively many of these very banks then went on to continue to loan money out to companies that were no longer profitable as well. These in turn became zombie firms. This was all done on the belief that many of these businesses were too big to fail. This cycle would go on for 2 decades, leading to the general stagnation in the Japanese economy and a dramatic decline in asset prices. By 2004 for example, residential real estate in Tokyo the capital, was worth only 10% of the 1980’s high. The most expensive land in the Ginza business district, had fallen to just an incredible 1% of its previous worth. As of 2012, the official interest rate has been 0.1%. The overall interest rate has remained below 1% since 1994. Although there has been sporadic growth spurts, the overall economy has not seen significant growth since the 1980’s. Meanwhile the world economy especially other areas of East Asia, has eroded the world market share of many Japanese companies, including multinational giants like Hitachi, Mitsubishi, Sony and Toyota. Japan has been losing its competitive edge in manufacturing to neighboring countries like China and South Korea for years. Japanese corporations have responded by making new hires temporary workers, with little job security and far fewer benefits. By 2009 these new type of employees comprised over 30% of the workforce. Wages have continued to stagnate for the entire labor pool. Since 1997, real wages have fallen an unbelievable 13%. This is unprecedented among modern developed countries. It is quite profound that it has occurred in the 3rd largest economy in the world. It has taken a total of 12 years, for the Japanese GDP to recover to former 1995 levels. More troubling is the decline in per capita output. Japan is becoming far less efficient with many companies no longer willing to invest in newer technology, because of cost. In response to the lack of growth and the looming threat of falling prices, the Japanese government has tried repeated bouts of stimulus that has caused a fiscal deficit since 1991. The results have been negligible at best. It did however, saddle the central government with a huge debt burden. As a percentage of GDP, it has now passed 240%. It is by far the largest in the world. In comparison the United States was at 101.53% of GDP, in relation to debt in 2014. 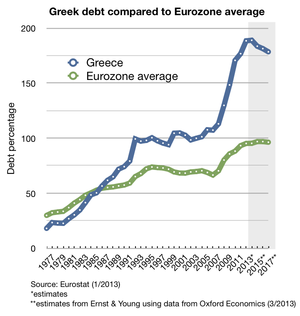 Even crisis ridden Greece which has captured the headlines for debt over the last few years, is now at 177.10% of GDP. It is true that Japan is unusual in that the majority of the public debt is held by the Bank of Japan and the domestic market. However, the enormous payments of interest on this liability, does not bode well for the future of Japan. It will become increasingly difficult to manage in the years ahead. 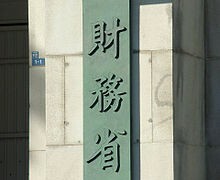 This is despite the high personal savings rate of the average Japanese citizen, especially among the elderly. It was these large deposits that enabled banks to make endless loans to corporate clients, that were often not financially viable. Again, even the demographics are against Japan. The country’s population is aging rapidly and the median age is among the highest in the world. As a rule immigration has never been encouraged, so Japan has a population that is actually in decline. There will be fewer workers to manage the economic output of the country in the 21st century. There will also be ever greater government spending on social entitlements, as the population ages. The government is claiming it will need at least an extra 9 trillion yen ($76 billion USD) by 2020 and that is assuming 3% annual economic growth, which is quite optimistic at this point. Japan is caught in a liquidity trap. It can no longer stimulate economic activity by lowering interest rates, mainly because they are already near zero. Profitable corporations are choosing to pay down debt through earnings, rather than making new loans. This in reality leaves only small amounts of capital for new investments. Corporate investment fell 22% of GDP from 1990 to 2003 alone. Japanese companies overall, became net savers as early as 1998 and that status has not changed. What maintained the larger GDP was the almost nonstop stimulus spending by the central government and the efforts of quantitative easing by the central bank. Unfortunately, these remedies cannot be continued indefinitely. 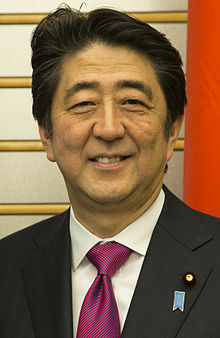 The latest version of this policy known as Abenomics was initiated shortly after the election of the present prime minister (P.M.) in December of 2012. P.M. Shinzo Abe has identified three arrows of reform that his government will tackle. They are decreasing worker productivity, lower inflation, and the aging population. The initial investor response to the new government initiative had been positive. The Nikkei 225 has rallied to over 20,000 from a low of 9,000 in 2008. 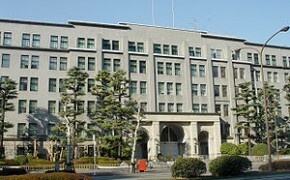 However the government of Shinzo Abe and the central bank are increasingly at odds. In early 2013, the head of the Bank of Japan Haruhiko Kuroda, dutifully launched a massive new round of quantitative easing. The initial agreement on economic policy has since diverged. The main point of contention is fiscal policy. The primary budget deficit which excludes interest payments on debt, is now 6.6% of GDP. This amount is causing increasing apprehension among Japanese bankers. A further issue between the central bank and the government is the rate of inflation. Although Mr. Kuroda had pledged to do what was necessary to boost inflation back to the 2% level, there is now some hesitation on the part of Mr. Abe and his government. He is questioning whether a new round of bond buying will achieve any better results than the previous ones. It is at last a partial recognition that quantitative easing and low interest rates alone, cannot move the Japanese economy back to a growth. At first all seemed to go well, with the central bank printing tremendous amounts of new money and the government spending more money than ever, to mitigate the negative effects of the raise on the consumption tax (CT) from 5% to 8% in April 2014. Stronger growth resulting from further structural reforms, was supposed to ease the pain of a further rise in the CT, scheduled for later this year. It is supposed to ascend to 10% this autumn. The rise in the CT is to help the government deal with the coming debt crisis. The commitment is to reach a primary budget balance by the fiscal year 2020 – 2021. This political promise has become more impalpable than ever. The first rise in the CT ended up tipping the Japanese economy back into recession in 2014. As a response, the central bank then pledged to buy 80 trillion ($670 billion USD) worth of new government bonds, on an annual basis. It was based on the assumption that the CT would rise again as planned in fall of 2015. However, the government has now stated that the tax increase has been postponed until at least April 2017. The reason given is that the fragile Japanese economy, cannot shoulder another hit at this time. The entire government policy of Abenomics is now in jeopardy. The Prime Minster is hesitant of even more printing of money to buy government bonds, when it has become clear that further tax rises at this juncture is not possible. There will not be any substantial improvement in the fiscal situation and many of the promised structural reforms, have failed to materialize. Worse yet, core inflation has now fallen below zero. It must be said though, that part of this is attributable to the decline in energy costs, as a result in the rapid decrease in oil prices. 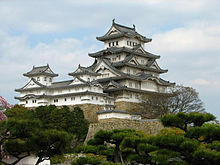 Lower fuel costs is one of the few bright spots afforded the Japanese economy at the present time. Quantitative easing on the scale that has been in place since the fall of 2014, has political costs as well as economic ones. It is true that property prices and the stock market are experiencing major revivals. The decline in the yen has certainly helped boost exports, which has been a benefit to a number of Japanese companies. However, smaller businesses and individuals have not really benefited and have instead paid higher prices for imports, as the Japanese currency valuation has taken a dive. An additional concern is the anxiety being created in the bond markets. The central bank by far is the largest purchaser of governmental debt. By buying such large amounts it has forced bond prices down, which is chasing out other investors. This is an ominous sign for the future. It is in reality destroying the secondary bond market, making future sales of government debt more difficult and increasingly risky. A record level of spending for this year has just begun. The government is now promising detailed plans by this summer, how the deficit will be reduced in the next few years. Social security cuts are probably off the table for political reasons. Making cuts by having Japanese seniors pay more for their own medical care, will also be difficult. This necessitates much larger cuts in other areas of the budget, which are just not very likely on that scale. It leaves the government few viable options as debt payments continue to rise. If inflation would return and the central bank was forced to raise interest rates, debt payments alone would overwhelm the Japanese federal budget. At that point further monetary expansion becomes impossible, unless the government will permit the destruction of the yen. A close look at the Japanese experience is a cautionary tale to those proponents of quantitative easing around the world, especially in Europe and the United States. These individuals continue to insist that the continued expansion of the money supply and ever lower interest rates, will bring the world economy back to growth. The Japanese economic story over the last quarter of a century clearly does not bear that theory out.